Coffee lovers start out innocently enough with drip filters, French presses, milk frothers, and stovetop espresso makers; but then next thing you know, they’re browsing Amazon for full-on espresso machines with all the bells and whistles. If you’ve reached that stage of coffee addiction, don’t worry, we’re here for you. We’ve researched everything you need to know about buying a shiny new espresso machine for your home and we’ve combed through the details and reviews for dozens of machines so you don’t have to. 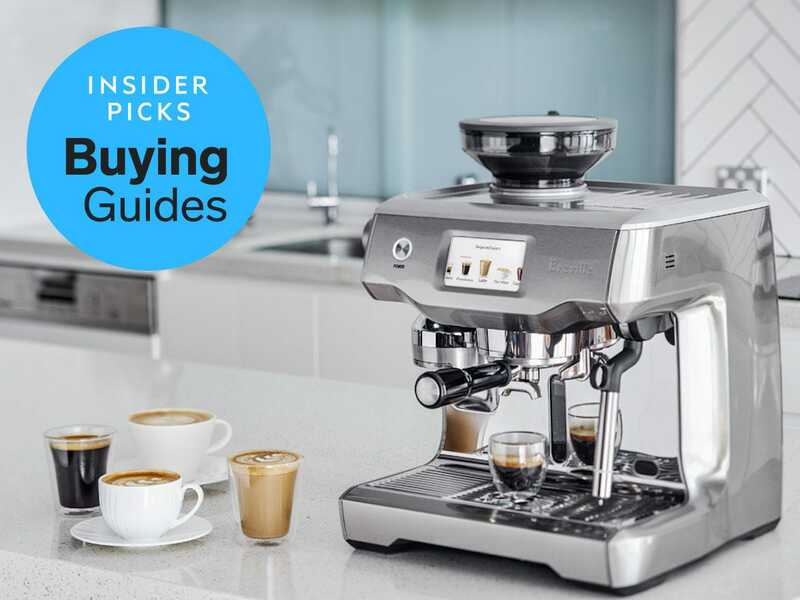 Before we get into the best espresso machines you can buy for your home, let’s take a look at all the key terms and information that you need to know to make an informed purchase. The result is a thicker, creamier coffee with more caffeine inside. Pressure seems to be the key defining metric of making real espresso, and that’s why stovetop espresso machines don’t produce „real“ espresso, according to the experts (but we still highly recommend them for anyone on a budget). Manual Lever Pump: It works just like you’d imagine it would — you manually pump the espresso out by hand with no help from electricity. Semi-Automatic Pump: Here, you’ll grind the beans and tamp them into the filter before turning on the machine. Then, you pump the button to turn it on until the water turns black, at which point you turn it off. Automatic Pump: This machine also makes you grind the beans and tamp them into the portafilter. The machine will automatically turn on to brew the espresso and go off again when it’s done. Super Automatic Pump: Finally, a super automatic machine takes everything out of your hands. It grinds the beans, tamps the grounds into the filter, boils the water, pushes it with lots of pressure, and takes care of the waste for you. It’s very easy, but it’ll cost you a pretty penny. Why you’ll love it: The semi-automatic Breville BES870XL Barista Express Espresso Machine makes top-notch espresso and it includes a burr grinder, tamper, and frothing pitcher. Most espresso machines don’t come with everything you need, so you end up buying a bunch of accessories to actually make your coffee. Not so with the Breville BES870XL Barista Express Espresso Machine. The Barista Express espresso machine uses a 15 Bar Italian Pump and a 1600W Thermocoil heating system to make rich espresso. Since it’s a semi-automatic machine, the Breville automatically adjusts water temperature after steam to extract the most flavor out of your beans. The machine also has a 67 fl.oz (2L) water tank with a nice handle for easy removal, and it comes with a replaceable water filter. If you push the 54mm stainless steel portafilter into the hands-free grinding cradle, the grounds will go right into the filter. The grinder shuts off when it’s done, too, so you don’t have to worry about figuring out if you’ve got the right amount. Finally, the included 54mm tamper ensures that your grounds are evenly pressed, so you get the most out of your beans. The Thermocoil heating system controls the water temperature, and you can watch the espresso machine’s pressure gauge. If you want frothy milk on top of your espresso, you can use the 360-degree swivel steam wand to whip up some foam in the included milk pitcher. A removable drip tray catches any excess, so you don’t end up with a huge mess on your hands. You do have to clean that part every day. Breville’s machine will also tell you when it needs a thorough cleaning, and it comes with a special cleaning kit. Follow Breville’s very detailed care and maintenance guide to keep your machine in working order. If you’re inexperienced, it’s a good machine to learn with, and if you’re interested in fiddling around with settings, you can do that, too. It’s an all-around great espresso machine, according to several reviews by experts and everyday users. The best part about this machine is that it comes with everything you need (except the beans). You don’t have to spend an extra $100+ on a good grinder or $25-$100 on a milk frothing pitcher and tamper. You will pay a bit more for it than other machines on this list, but it’s well worth it — especially now that this machine costs $559.94 instead of $999.99. Cons: Expensive, but it’s on sale! Why you’ll love it: The Gaggia Classic Semi-Automatic Espresso Maker costs nearly half as much as our top pick, but it still makes great espresso and it’s gorgeous. If the Breville Barista Express Espresso Machine’s price tag scared you off, don’t worry. The Gaggia Classic Semi-Automatic Espresso Maker is another great choice with a much lower price point. It has classic Italian good looks, and it comes from a trusted company that started in Milan back in 1938. The Gaggia Classic is made out of high-end materials, and it shows. It’s a classy, durable machine with chrome-plated marine-grade brass 58mm portafilters and grouphead. The housing and two filter baskets are made of stainless steel. The machine comes with a coffee tamper, a 7-gram measuring scoop, and an instructional CD. You will have to buy the milk frothing pitcher if you want milk foam on your espresso. We recommend this pitcher from Rattleware. The machine’s Pannarello steam wand should froth your milk decently. It can even dispense hot water for tea or Americano coffee. Espresso Perfecto calls the Classic „a quick and snappy machine.“ The 17-1/2-bar pressure pump is more high-end than most other espresso machines on this list. Its three-way solenoid valve makes it easy to pull shots of espresso quickly because it releases the pressure from the group head right after you’re done making the first shot. That way, you can remove the portafilter and get ready to pull your next shot. It’s a helpful feature for when you need to make espresso for more than one person. Although it’s very easy to use — you just fill the portafilter with grounds, attach it to the machine, and press the button to start — The Gaggia Classic isn’t as flexible or intuitive as the Breville Barista Express. The user manual is less detailed, too, so you have to have a basic idea of what you’re doing or browse the internet for tips. The machine has a one-year warranty if you run into problems. It’s a bit tricky to clean, too. You have to disassemble it a bit to get at the water filter and clean it. Critics don’t recommend the frothing steam wand, either, because it makes inconsistent milk foam. If you’re unhappy with the milk foam the steam wand makes, you can read our full guide on the best stand-alone milk frothers here. Why you’ll love it: The De’Longhi EC155 15 BAR Pump Espresso and Cappuccino Maker is affordable, but it still makes strong espresso. Not everyone can afford a top-of-the-line espresso machine, but there are some good options out there for less than $100. The De’Longhi EC155 15 BAR Pump Espresso and Cappuccino Maker is the best of the sub-$100 category with its easy-to-use design and tasty espresso. It’s a basic machine that gets the job done, but it has great Italian design and it’s made by a brand that’s a household name in Italy. You get a manual milk frother and a built-in tamper along with the machine, so you do have to buy your own grinder and milk frothing pitcher if you want foam on top. Many reviewers and users complain that the tamper and milk frother aren’t that great, though, so you may end up buying those, too. You can check out our best milk frothers here. Some of you will stick with the machine’s frothing wand, but you’ll still need a milk frothing pitcher, so we recommend this one from Rattleware. Should you want a better tamper, we recommend this one from Rattleware. To save money on the coffee grinder, you can try this manual Hario Skerton Ceramic Coffee Mill, but if you want a high-end one, you may pay more than $200 for it. Regardless of whether you buy extra accessories, it’s still very affordable, and you’re really buying this machine for the espresso. The De’Longhi delivers in that regard. It’s a 15 bar machine with a self-priming function, so you don’t have to go through the hassle of prepping the machine. The 35oz water tank is removable for cleaning and it has a drip tray to catch spills. and a durable, high-quality stainless steel boiler to ensure many years of delicious espresso. De’Longhi offers a one-year limited warranty and you can check the user manual for extra details. User reviews on Amazon are mostly positive and it’s the number one best-seller on the site for semi-automatic espresso machines. Experts from Best Products, Coffee Lounge, Fresh Presso, and Coffee Maker Picks all recommend the De’Longhi EC 155 Espresso and Cappuccino Maker as a great budget option. Even if you end up buying everything we recommend for the De’Longhi, you’d still pay a mere $168.47, which is very affordable for an espresso machine.